Chicago cops will tell you Roseland is one of the most dangerous neighborhoods in the city. The Far South Side community has problems with unemployment, poverty, gangs, and prostitution. There are frequent news stories about the gun violence in Roseland. However, the residential architecture speaks to the fact that at one time Roseland was a thriving area. Take, for instance, this Sears Osborn. It is a mess today, but as recently as 10 years ago it was an cozy Craftsman bungalow. 602 W. 115th St., Chicago. House in the mid-2000's. Still looking good! Photo courtesy of Jerry Pittman's Chicago. Sears Osborn. Sears said that the Osborn "will appeal to the lover of nature" because of the three porches (one on the rear of the house). This Sears Osborn was built in 1918 or 1919 by Henry Heath, a local carpenter, and his wife, Maud. The Heaths lived in the house until at least 1923. By 1928, the residents were Ralph H. and Isabelle Coe. 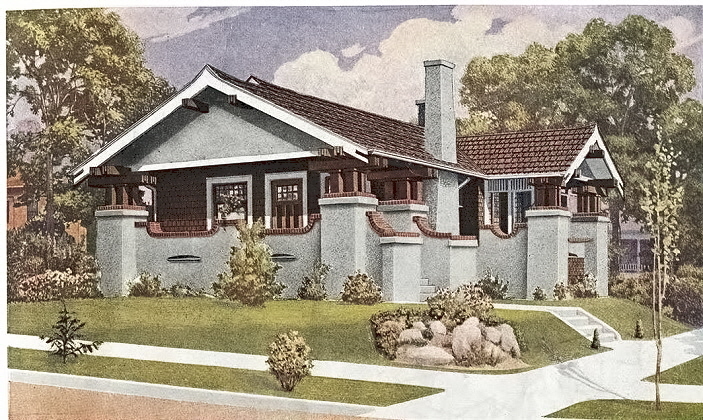 When Ralph listed the Osborn for sale in 1943, the real estate ad called it "Roseland's most distinctive bungalow." The house changed hands a few times in subsequent years. Dr. Angelo Ravasi, a noted surgeon, and his wife Rosa owned the house from the mid-1950's until 1976 when Rosa passed away. Photo of the house taken during an architectural survey in the early 1970's. 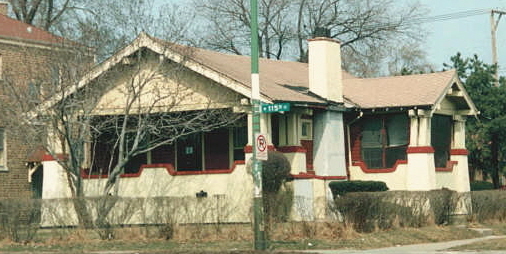 Around 1979, Carolyn Glass moved into the house. She lived there until 2006 when she sold, fearing for her safety. The house went into foreclosure in December 2012. View of the dining room door. The Osborn had two styles of pillars. The living room of the Osborn as featured in the 1918 catalog. 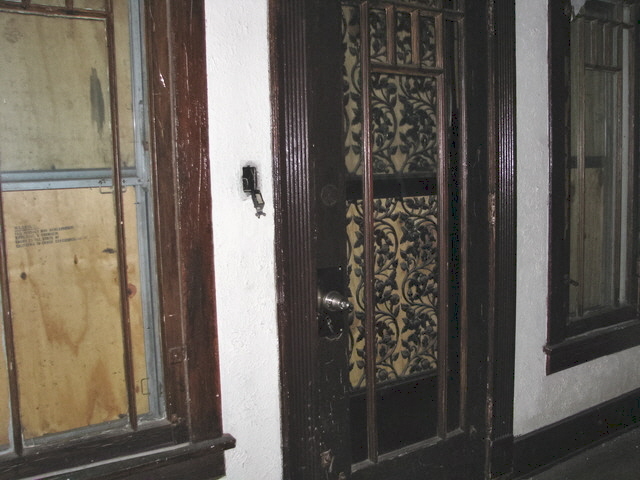 Beautiful front door is still there. The architect of the Osborn is Andrew F. Hughes. Well, Elaine, here's the deal. House has been owned by this owner since 2005. She bought it from Mrs. Glass, and things went downhill after that. This owner was in foreclosure in 2011, but I do not believe the house is currently owned by a bank. 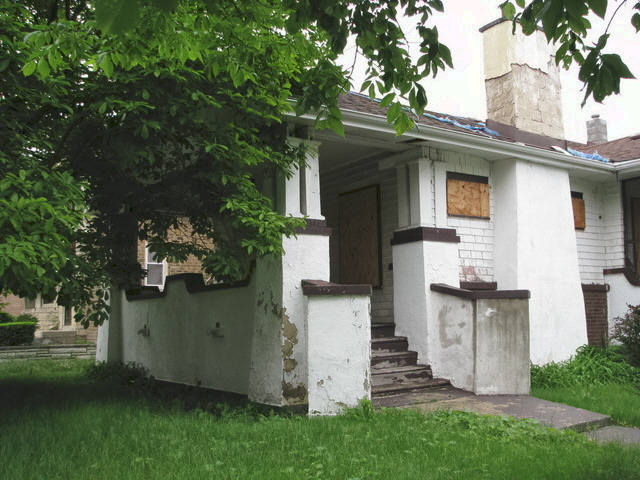 In March 2018, the city cited her for not registering the house as vacant. 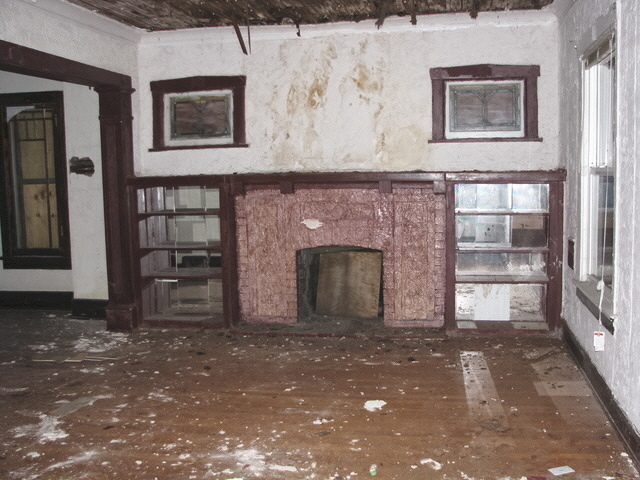 That means, the owner not only has to pay property taxes, but additional fees because the house is vacant. The owner is not behind in paying property taxes. I was wondering how the city has let this negligence go on for so many years, but it looks like the address is wrong in the city database as 604 rather than 602. That may have been how it slipped through the cracks. I have no idea why this woman would not have sold the house years ago. 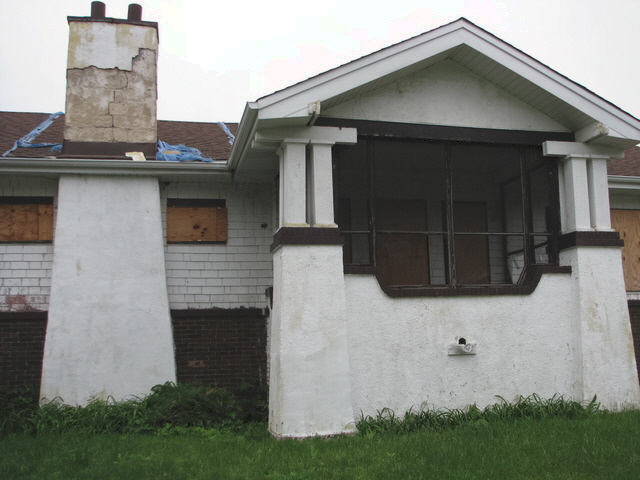 There is a new-ish organization called the Cook County Land Bank that uses public funds to fix up and resell abandoned houses. Unfortunately Roseland is not in the selected list of communities where the CCLB operates.